Every few years, we all do the same thing: re-evaluate our effects lineup and get the urge to redo the whole thing. A while back I did that, and looked to incorporate smaller pedals (see my post about “clones”) while having it all nicely organized, easy to use, and self-contained in a decent protective case. The problem I discovered early on was that very few pedalboard manufacturers build pedalboards with bottoms. Might be nitpicking on my part, but I always preferred to NOT cable-tie wires to the underneath of the board. Because guaranteed….there would be a time when a wire would go bad, or I decided to switch something around, requiring snipping the cable tie and repositioning everything. Sounds easy enough, but not always. I also had a few items that I wanted under the board that didn’t really belong there, but it was more convenient underneath instead of on top – taking up valuable real estate – or off to the side on the ground. What comes to mind is my Radial JDI Duplex DI box (a rather large unit) and a feedback destroyer, which doesn’t need to be employed by my foot ever – it’s always on. Then I looked at those “cheap” pedalboard cases. While those satisfied the “bottom” problem, they clearly don’t have a real “platform” for the pedals – the bottom IS the platform. SO I decided to go the hybrid route, doing it myself. I’m not intending to do a step-by-step instructional post here. But just a high-level look at what I did and the outcome, so that hopefully it inspires you to do it yourself in your own way. After purchasing the case (didn’t get it from Amazon, but this was the case http://www.amazon.com/CNB-PDC-410-Pedal-Case/dp/B000WM8V9I/ref=sr_1_1?ie=UTF8&qid=1374859254&sr=8-1&keywords=cnb+pedal+case ). I took careful measurements of the INTERIOR space as well as the height. Then it was a trip to Home Depot. I bought small but hard wood pieces that would support enough weight from the pedals and my foot stomping down on them. Then I began laying out a structure for the platform. I first built the base as if the entire platform was to be the same height, just enough to lay wires along the bottom. Then, I decided to raise a section where the large items underneath would go. The added benefit to this was creating a “tier” so that I could easily reach the pedals in front of others. (Note: all of my pedals in the picture with the exception of the Zoom G3 are wired into the Moen GEC-9 Effects Loop Controller. So the only pedals I’m really ever hitting are the GEC-9 and the G3….hence the funky positioning of SOME of those pedals). Once I made the tier, then I did minor tweaking to make everything fit – such as drilling holes for the wah pedal’s feet so that it would sit flatter on the board. And after a coat of primer and black metallic paint, it was done. Everything fits snug and is exactly in the position I needed it. And when all was said and done, the entire board/case cost me approximately $90 including the velcro for the top. I hope this inspires you to look for good DIY ways to meet your needs, and proves to you that you can achieve quality (if not pro) results with very simple ideas and tools/materials. 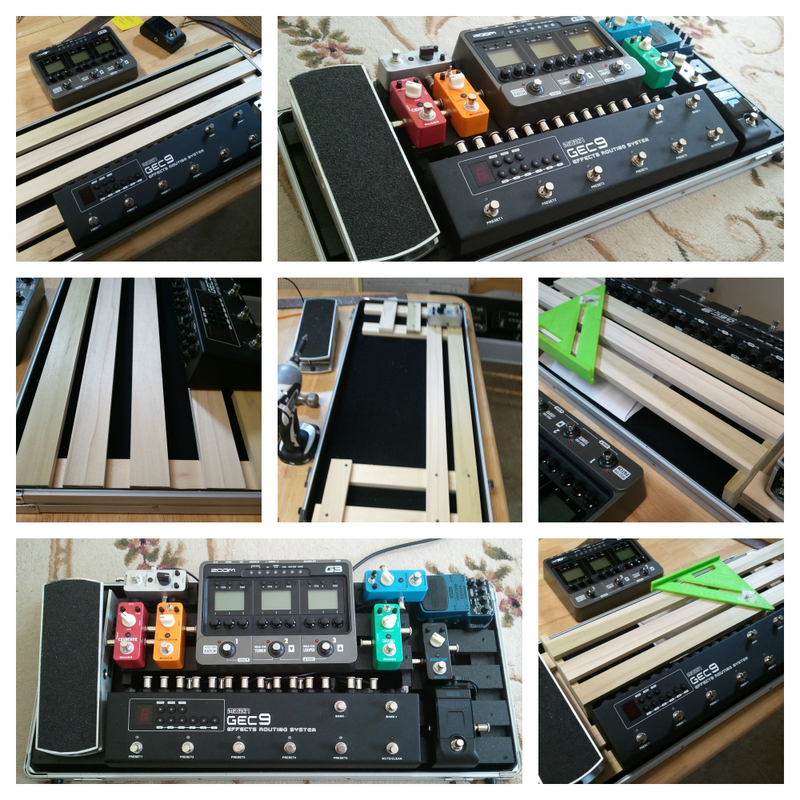 This entry was posted on July 26, 2013 by davealloway2001 in Accessories and tagged Custom, DIY, Effects, Guitar, Homemade, Music, Pedalboard.